Chodala is the brother of Seryn and Ashkhan of the Urshilaku Ashlanders. 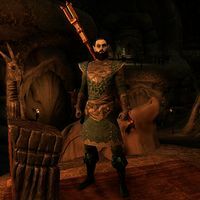 He believes he is the Nerevarine and has allied with the Red Exiles in an attempt to exert his influence over all the Ashlander tribes. Chodala first appeared in Morrowind as one of the failed incarnates, and later reappeared in Legends in the cards False Incarnate and Chodala's Treachery. This page was last modified on 18 September 2018, at 19:21.